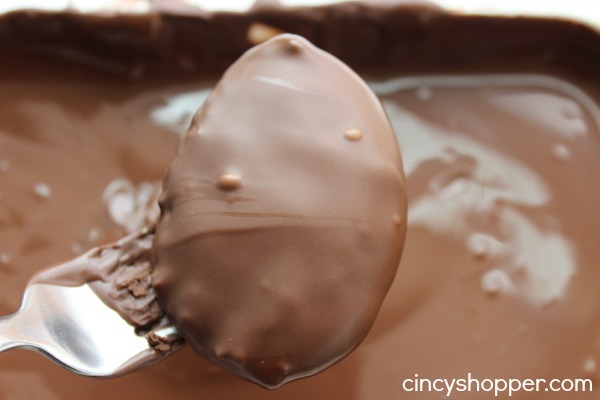 Oh my this Homemade Reese’s Eggs recipe is going to knock your socks off! Well, it did mine and also my kiddos ha ha! Every year when all the Easter Candy starts appearing one of the first candy items we see on the shelves are Reese’s Peanut butter Eggs. All I can say is oh my! Reese’s Eggs are my FAVORITE candy. They are also my kiddos favorite. Peanut Butter and Chocolate oh my my my! Easter would not be Easter without Reese’s East eggs. Last week I purchased a few Reese’s eggs while checking out at the grocery. It was honestly a battle in the house as EVERYONE wanted more. I decide it was time to have our own homemade Reese’s eggs. So, I hopped in the kitchen and this creation was perfect! The texture and flavors were spot on. 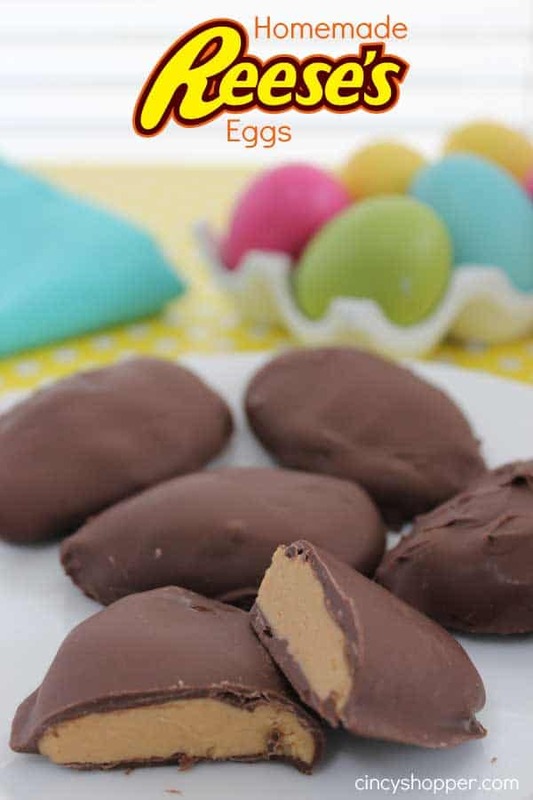 With just a few ingredients and a bit of time (and messy hand, ha ha) we can have unlimited Reese’s Peanut butter Eggs at home. 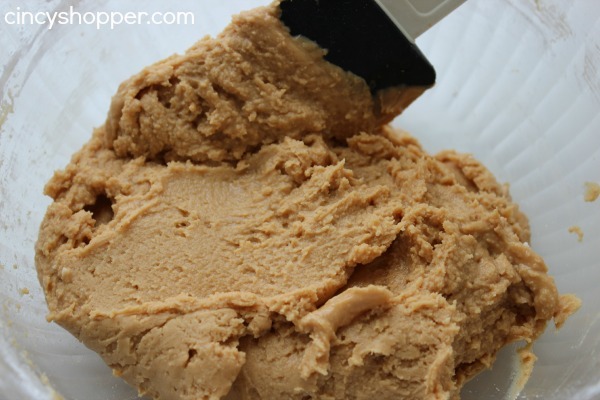 You can use any Peanut butter with this recipe. 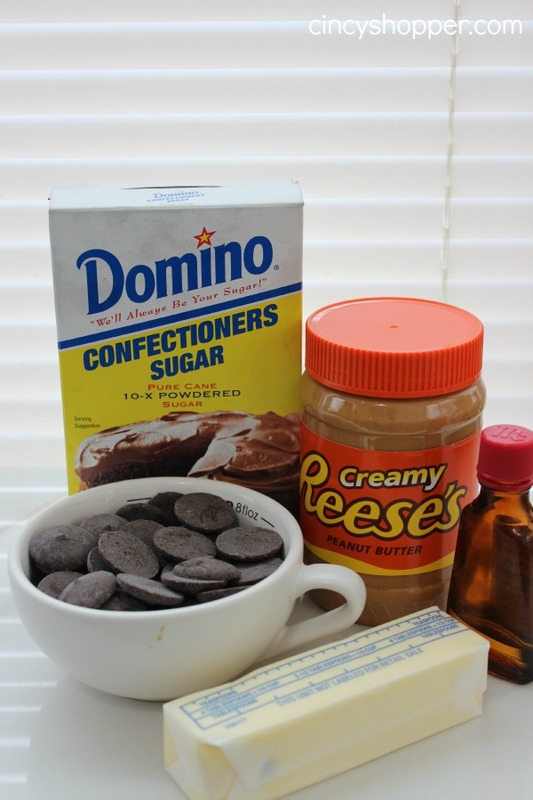 I used Reese’s so I could convince the kiddos that they were made with Reese’s PB , ha ha! I found it at Remke. Divide mixture into 10 portions and shape into a egg shape. I am so excited for Easter this year. I know spring weather is almost here and all the spring colors are arriving in the stores. Many of the stores are putting out all of the Easter items. 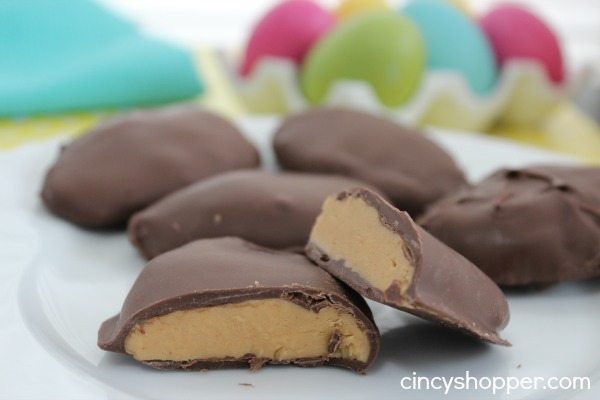 This year I plan to make up quite a few of these Homemade Peanut Butter Eggs and other candy and chocolates to make special Easter Baskets. I figure I can make up some yummy treats and wrap them in treat bags with pretty ribbons. Stay tuned for many GREAT Easter treats and DIY. I have so many planned and I am eager to share them all with you. Do you have a favorite Easter candy? I would love to hear about yours! Thanks for the great recipe. My husband suggested I use our deviled egg holder to shape the eggs. It was perfect! They look so cute and uniform. They were a little difficult to get out of the holder, but I would definitely use it again. I got about 40 chocolate eggs from this recipe using that tray as a mold. Oh wow Jody! I had not thought of that idea. I plan to make some other eggs next week and I am going to have to give that trick a try. Be very careful as I am sure you are aware, they are quite addicting, lol. Glad you made these as these were my favorite eggs I made so far. Thanks for the fabulous recipie! Ha Ha Bailey! I have a secret little bin in the back of the fridge that is not see-through to hide my stash. Reese’s are my favorite and always have been. A bit of an addiction. Glad you are enjoying too! I thinned the chocolate just a wee bit by adding a tablespoon of Crisco to it (I like for the pb to be the star of the show) and after shaping the dough I inserted some wooden skewers into them and then froze the eggs. Those skewers made dipping them into the chocolate a breeze. I do the same thing with my buckeye candies using toothpicks. Thanks for sharing your recipe! I would also suggest that you try putting in some graham cracker crumbs-they really help to give that little bit of “gritty” texture that the original reese’s eggs have. :) that’s exactly what I did. I’ve made “Reese” bars before and the Graham crumbs were delightful. Thank you for sharing this amazing recipe! I used homemade almond butter and I was able to make a dozen with plenty of leftover chocolate! Next time I may use 6oz. My son has a peanut allergy but now he can enjoy a classic candy! Thanks again! wow amazing and so simple.Thanx for sharing,as i love reese and can’t find easily in Greece!!! Yummy! Do you use salted or unsalted butter?!? Amazing! I think I’m going to try and attempt to make these this Easter! Great idea to use a deviled egg tray/plate to mold the peanut butter filling into egg shapes. . I plan to coat mold lightly with vegetable spray in hopes of being able to remove them easier. I made these tonight. My daughter and I are making Easter baskets with homemade treats for 2 of my aunts in nursing homes. I came across this recipe and thought these would be perfect and omg were they! These taste so amazing!!!! Thank you for posting this! Can almond butter be substituted? I used white chocolate instead of dark and they were AmaZing!! And so simple! My family and friends were blown away when I brought these to a get together. Thinking I’ll do white again and draw on them with food markers for Easter to look like Easter eggs ;) Thanks so much for sharing!